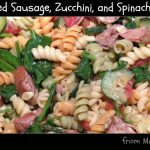 So, you wanna know a secret before we dive on into today’s Smoked Sausage, Zucchini, and Spinach Pasta recipe? Here it is: For years, I thought that I hated zucchini. Turns out, however: I really don’t! As I try to incorporate a wider variety of veggies into my diet, my current favorite way to enjoy zucchini is oven baked with Parmesan, various spices, and garlic, and/or in a sheet pan dinner containing other stronger or saltier flavors such as smoked sausage or Polska kielbasa. The other night, however, I was also craving pasta, so decided to see what would happen if I mashed up that idea of garlicky browned Parmesan-y zucchini goodness with a few other things, such as a little rotini (you’ll want a stronger shaped pasta to stand up to all the stuff), some fresh spinach (for an extra punch of vitamin-packed greens & flavor), a can of fire roasted tomatoes (to play up the smoky flavor of the sausage), and a bit more Parmesan (because, cheese). 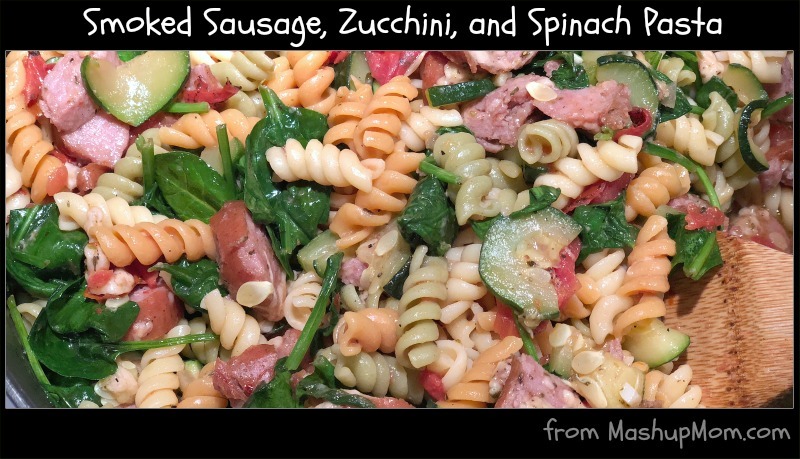 What happened was this: Smoked Sausage, Zucchini, and Spinach Pasta. And, what a lovely combination it all turned out to be! I definitely do like zucchini, when enjoyed in conjunction with these types of textures and flavors. So, let me tell you exactly how this recipe all came together. Cook pasta al dente according to package directions, then drain and return to pot. Turn heat under that same pot to medium and stir in spinach, fire roasted diced tomatoes, and 1/4 cup shredded Parmesan until cheese is melted and spinach is starting to wilt. Meanwhile, heat olive oil in a 12″ cast iron skillet over medium-high heat until shimmering. Add onion and cook for 3 minutes, stirring occasionally. Add garlic and saute another 30 seconds, then stir in zucchini & kielbasa. 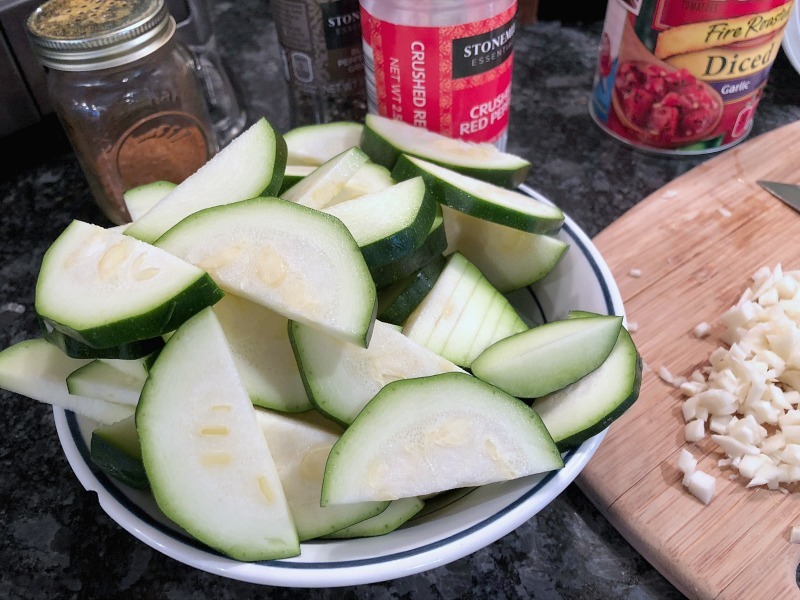 Season the zucchini and sausage with seasoned salt, black pepper, crushed red pepper, and Italian seasoning, then continue sauteing over medium-high heat for 8-10 minutes or until zucchini is lightly browned, stirring occasionally. Top your sausage and zucchini with 1/2 cup shredded Parmesan. Move your skillet into the oven and broil for 3-4 minutes until cheese is browned. Remove the skillet from oven and add its entire contents (including the pan juices from the zucchini) to your pot of pasta, tomatoes, and spinach. Stir until everything is nicely combined, and spinach is completely wilted. Serve your sausage & zucchini pasta with additional Parmesan to top (optional). 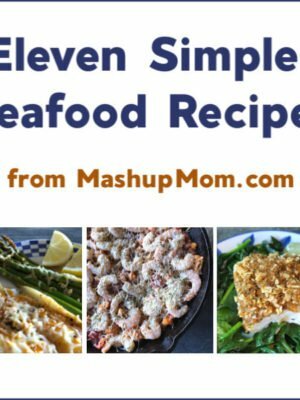 This is one recipe mashup that really works — And, while much of this recipe does require hands-on time with its various steps of chopping, sauteing, boiling, draining, and broiling, it’s all very straightforward! 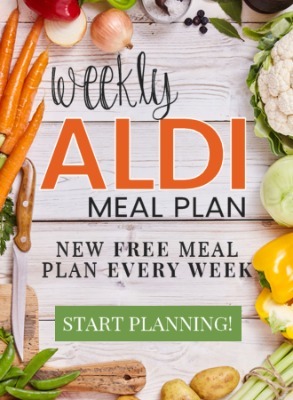 The timing also works out so that each step should feed nicely into the next, as long as you start your pasta water boiling around the same time as you start chopping your vegetables and sausage. Smoked sausage, zucchini, and spinach pasta is a filling all-in-one weeknight dinner that’s just jam packed with flavor. If you do want to add a side, though, try a crusty baguette or a crisp salad for textural contrast. 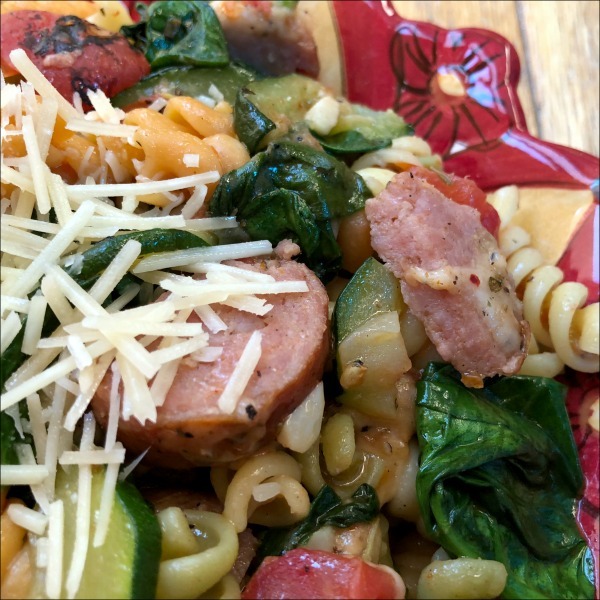 Smoked sausage, zucchini, and spinach pasta is a filling all-in-one weeknight dinner that's just jam packed with flavor. Cook pasta al dente according to package directions, then drain and return to pot. Turn heat under that same pot to medium and stir in spinach, fire roasted diced tomatoes, and 1/4 cup shredded Parmesan until cheese is melted and spinach is starting to wilt. Meanwhile, heat olive oil in a 12" cast iron skillet over medium-high heat until shimmering. Add onion and cook for 3 minutes, stirring occasionally. Add garlic and saute another 30 seconds, then stir in zucchini & kielbasa. 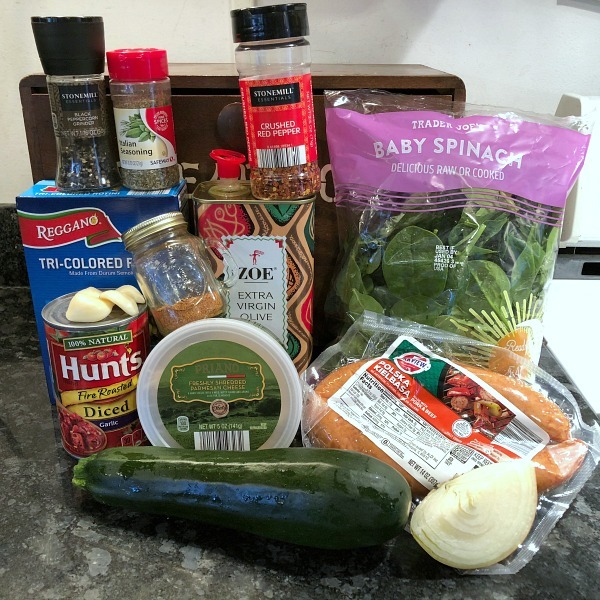 Season the zucchini and sausage with seasoned salt, black pepper, crushed red pepper, and Italian seasoning, then continue sauteing over medium-high heat for 8-10 minutes or until zucchini is lightly browned, stirring occasionally. Top your sausage and zucchini with 1/2 cup shredded Parmesan. 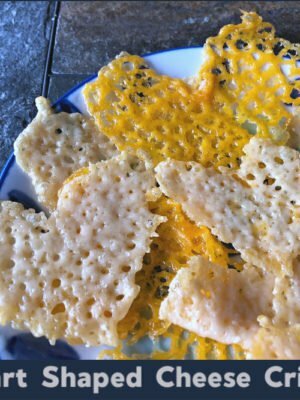 Move your skillet into the oven and broil for 3-4 minutes until cheese is browned. Remove the skillet from oven and add its entire contents (including the pan juices from the zucchini) to your pot of pasta, tomatoes, and spinach. Stir until everything is nicely combined, and spinach is completely wilted. 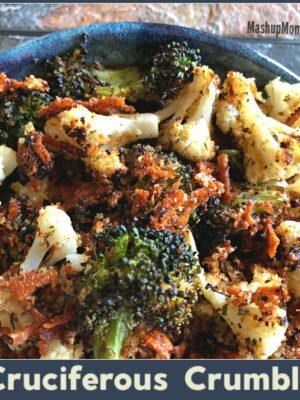 While much of this recipe does require hands-on time with its various steps of chopping, sauteing, boiling, draining, and broiling, it's all very straightforward! The timing also works out so that each step should feed nicely into the next, as long as you start your pasta water boiling around the same time as you start chopping your vegetables and sausage. We made this on Friday night and loved it!! I will say to leave out red pepper flakes or little ones. I put less than called for but still was a bit spicy and definitely spicier when served as leftover. My boyfriend is super picky and he loved this! 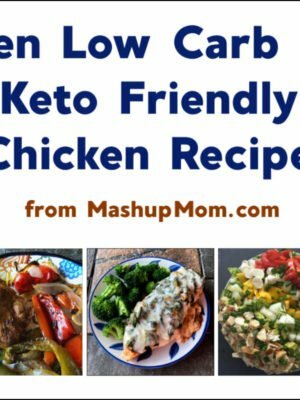 We will definitely add this to our list of go-to recipes! I used a half jar of pesto that I had along with the rest of recipe. Delish! Made this last night, and it was so good. Another solid addition to the “make it again” list!